Shuuuuuuut uuuuuup. The Only Way Is Essex star Lauren Goodger launched her own range of fake tan a few months ago and it’s been met with a whirlwind of fans eager to get their hands on it. My good friend Ree has been singing its praises continually, but I have to admit I was dubious. There were too many things going against it – the name, the celebrity face… was this going to be another endorsement that isn’t worth its weight in vajazzles? I finally got around to trying the Lauren’s Way mousse tan at the weekend though and within about ten minutes had tweeted Ree to tell her how much I loved it… “Oh my god, I think I’ve found a new favourite tan!” And honestly, I think I have. I like it. A lot. What’s different about this tan than the many others I’ve tried before, is that it’s practically impossible to go wrong. A few pumps of mousse onto the mitt and you’re well away, smoothing it into the skin to create an instant flawless golden glow. It practically melts away, leaving no kind of streaking or patchiness and drying within minutes. It’s not scary, it’s easy to get a good result and it doesn’t streak or leave you with unsightly hands or feet because it’s easy to buff any excess away even after it’s dried to the touch. (You can even leave the house before washing it off as it still looks pretty awesome.) I’ve been applying this every other day and have built up a really natural and flawless colour that doesn’t even smell of biscuits! Just in case you’re wondering – this is a tanned arm! 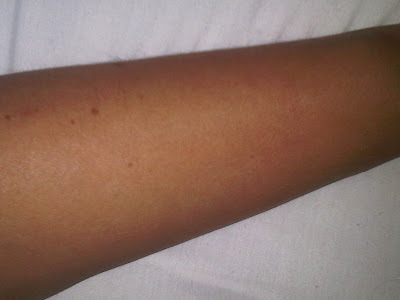 I love a fake tan, but what I don’t like is that it takes ages faffing around before, during and after application. Lauren’s Way mousse is the easiest, most fuss free and flawless looking tan I have ever used – and I’m not just being dramatic! Regardless of the endorsement or the name behind the brand, this really does stand the test and wins my complete and utter approval. So much so that I’ve managed to wangle a bloody good treat for you… Lauren’s Way have been kind enough to give me an exclusive discount code to share with my lovely readers. For a limited time you’ll be able to get 25% off any Lauren’s Way tanning product when purchased through their online shop. Wowzer! All you have to do is enter the code BLOG123 at the checkout when asked for a coupon code and you can be bronzed and beautiful in no time. Don’t be jel, be reem. Full details of the offer: enter code BLOG123 at the checkout before 31st August to receive 25% off any Lauren’s Way tanning product. Shipping will be charged as normal. Follow Lauren’s Way on twitter or become a fan on facebook. Shop the tan range here. NB – This is an exclusive offer for London Beauty Queen readers so please don’t re-post or promote the code through other channels without permission.